We are here to help you when dental emergencies arise. Dental emergencies are never fun – or convenient. But we’re here to help in your time of need. If you have a dental emergency during our business hours, please feel free to stop by our office for an evaluation. If your emergency happens after hours, call our office (972-833-4700) and our answering machine will provide you with our emergency contact information. We understand that some dental issues and pain need to be dealt with promptly, that’s why our emergency care line is available 24 hours a day, 7 days a week. Below you will find helpful information regarding certain dental emergencies. Follow the steps below to manage a lost tooth, and then call our office immediately after. Handle the tooth by the top or crown, being careful not to touch or wipe off the root of the tooth. If the tooth is dirty rinse the tooth using milk or water if milk is not available. Do not scrub the tooth! If possible, place the tooth back into its original location. Be sure it’s facing the correct direction. If you’re not able to place the tooth back into the socket, put it in an Optimal Storage Environment (OSE) kit, milk or water (water only if both of the other two options are not available). If none of these are accessible, store the tooth between your cheek and gums or in a clean cloth. Chipped teeth that don’t cause pain are rarely considered a dental emergency. If you chip a tooth, contact our office or stop by as soon as possible. Rinse your mouth thoroughly with warm water. Use gauze to apply pressure to any site of bleeding for 10 minutes or until the bleeding stops. Place a cold compress on any site where facial trauma may have occurred. Take an over-the-counter painkiller to reduce pain. Follow directions on the bottle. Rinse with warm salt water to dislodge any food debris. Clean the area around the tooth with gentle brushing and flossing if the site is not too painful. Do NOT place aspirin at the site of the toothache. This may cause a chemical burn of the gum tissue. Apply a cold compress on the outside of the cheek. If there's visible swelling, apply a cold compress alternating 10 minutes on, 5 minutes off. For soft tissue injuries such as lacerations (cuts), the following steps should be taken to minimize risk of pain or infection. Rinse the area thoroughly with warm water. With gauze, apply firm, gentle pressure for 15 minutes. Apply a cold compress to the outside of the affected area to control bruising and swelling. 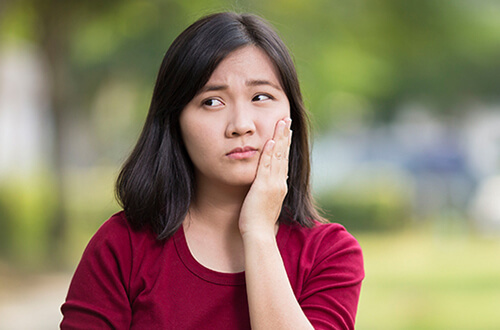 Contact us immediately if bleeding can't be controlled or if you have a large laceration associated with significant dental trauma (loss of a tooth, swelling).